Mark/Creative Commons on FlickrWho needs a holey old tent? Nobody! Upcycle that would-be trash into a DIY stuff sack for your sleeping bag. Ripped tent? Don’t trash it! Give your old tent a second life with our step-by-step instructions. Repurposing gear is a fun and easy way to reduce your carbon footprint and to show off your upcycling skills. So dig out those busted tents, grab your sewing kit, and learn how to make a stuff sack! Cut out a usable section of the nylon tent material, leaving out the netting, zippers—and rips! Decide what size you want your bag to be. Using the piece of fabric you chose, cut a rectangle double the size of your final stuff stack. You’ll be folding this in half a few steps down. Note: Keep this rectangle shiny side up. This is the waterproof side, which you’ll want to keep on the outside of your finished sack. Lay out the fabric so that the rectangle is horizontal, with the longer edges on the top and bottom. Fold the top two corners down about an inch then fold the entire top of the fabric down to align with the bottom of the folded corners. This will create a pocket to string your drawstring through at the end. If the string is thicker, just make this part a little longer to fit the string. Once you’ve done this, secure the fabric with binder clips. You can use pins instead, but binder clips don’t require poking extra holes in your waterproof material. Sew along the bottom seam of this folded-over section, leaving a big enough channel for your drawstring cord. This secures the pocket. You can either sew by hand using a simple backstitch technique, or if you have access to a sewing machine, go for it. 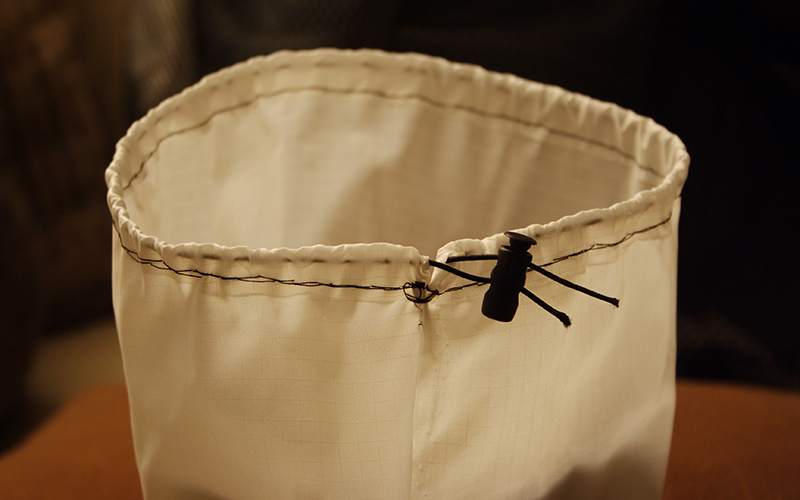 Now sew along the edges of the material (bottom and side), leaving the side with your drawstring channel open. Turn your bag inside out. You’re almost there! Don’t forget the rest of your tent! You can salvage cord from it, too: Try the rainfly rope or the poles’ suspension cord. Thread your cord through the drawstring channel. This can be a little tricky. Try using a pen to push your cord all the way through the drawstring channel. Tie off your drawstring with a basic knot or add a cord lock. Now that you have a new stuff sack, why not continue repurposing those tent parts? Try making shopping bags or kites with the remainder of the fabric. Use the poles to make a quick and dirty garden trellis. Even the waterproof rainfly can be sewn into a poncho or a baby bib for future hikers. Read how big gear companies are repairing and reselling items as part of a new recommerce trend. Get creative ideas from our guide to repurposing gear. Learn how to repair your own gear. Get tips on reducing your energy use, inspired by AMC’s White Mountain huts.